This is a scrumptious Roasted Chicken Rice recipe. The chicken was marinated with homemade ginger and garlic paste. I have used whole chicken breast for this recipe, but you can opt for whole chicken or chicken legs. So, to complete the meal, serve over steamed rice cooked with the Hainanese chicken rice paste and chicken stock. 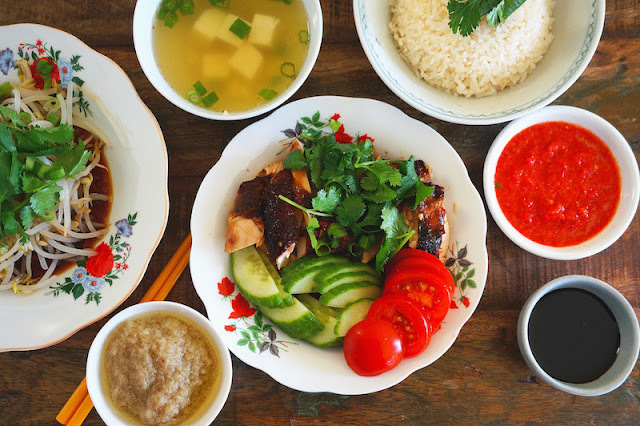 Some good accompaniments for the chicken rice are ginger and garlic paste, cucumber and tomato slice, fresh chili sauce, dark caramel soy sauce, aromatic soy sauce, blanched bean sprouts, and tofu soup. Marinate the chicken with ginger and garlic paste, 5 spice powder, light soy sauce, and honey, for about 3 to 4 hours. Preheat the oven to 200˚C (400˚F). Place the chicken on tray and roast in the oven for about 30 to 40 minutes minutes or until the chicken is fully cooked. To serve the chicken rice, chopped the roasted chicken into bite size pieces. Arrange the plate with some chicken, cucumber, tomatoes, rice and top it with some coriander.